Hello! 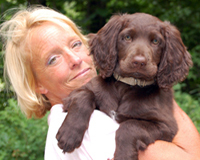 My name is Mary Wilson and I am the founder/owner/breeder and trainer for vom Whispering Winds. 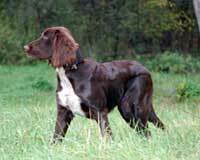 I live and train my dogs just east of the Twin Cities of Minneapolis & St. Paul, MN near the St. Croix River which is the border between MN and WI. 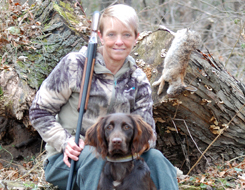 I was first introduced to the Deutsch Langhaar in 2008 at Pheasants Forever's Pheasant Fest in St. Paul, Minnesota. In April 2008, my first Deutsch Langhaar, Brea, was born. It seemed like an eternity for her to get here. Brea was finally old enough to fly at 8 weeks of age and arrived at myhome in the first part of June, 2008. We went to the airport to pick her up and of course, her flight was a half hour late due to some poor weather in Colorado. I waited patiently and she finally arrived. I opened up the kennel door and Brea came right out like she owned the place. From right at that moment, we became a team. Brea laid down on my lap the whole way home. When we introduced her to the rest of the gang (my other dogs), Brea fit right in. The next day, I took Brea out to the woods to find rabbits. Brea's favorite thing is being out in the woods. She took to them very well for only being 8 weeks of age and still loves them to this day. We trained for the VJP that whole first summer and got to test the following April (2009). The test was held in Janesville, Minnesota. It was a cold, rainy day at only 32 degrees Fahrenheit. The day was very long and finally the scores were read. Brea received a score of 67 points so I was very happy. We proceeded to train for the HZP that summer. It was a lot of work, but all of that work has definitely paid off. In October 2009, we ran in the HZP at Hugo, Minnesota (Kelly Farms). It was another cold and rainy day at 50 degrees Fahrenheit. We received a final score of 187 points with a huge smile and tears of joy! If you are a first-time puppy owner, my advice is to train and handle your own dog. 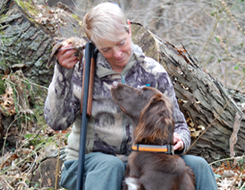 I would also suggest that you find a professional trainer that will give you hands-on lessons with your dog. 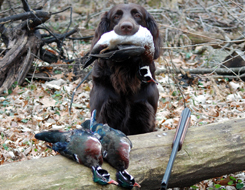 In the summer of 2010, Brea and I trained for the ultimate test of a dog's versatility as a hunting dog. That September, we passed the VGP with a score of 312 points and a Prize I! Brea has been a true companion. She is honest and I trust her completely. She is a team player and enjoys working for me. Her favorite training activity is doing drags. 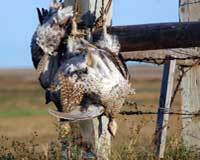 And in the fall, we head up to northern Minnesota to grouse hunt. 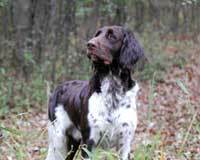 Brea loves the woods and likes hunting the logging trails. I would like to thank my better half (Ron Danielson) for supporting me through all of the training. Thanks to the judges who gave up their time to evaluate Brea. And thanks to the Rohling boys and their significant others for picking out a beautiful puppy for me. Thank you again guys. And now the fun is starting all over again with Ella and Breager, the newest additions to our Deutsch Langhaar family.